The laws and guiding documents concerning District Mineral Foundation (DMF), such as the state DMF Rules, the Pradhan Mantri Khanij Kshetra Kalyan Yojana (PMKKKY), and the DMF Trust deed promulgated by the Union Ministry of Mines indicate institutional arrangements that DMFs should follow. These include an administrative set-up as well as instruments of transparency and accountability. However, some of these provisions lack clarity or necessary elaborations and need to be strengthened. For DMFs to remain transparent and accountable, certain key things need to be ensured. A primary one is representation of mining-affected people in the DMF body to ensure transparent decision-making and building stakeholder confidence in DMF operations. Besides this, other key instruments to ensure transparency and accountability, include having comprehensive audits of DMFs to review financial management as well as performance of the institution, mechanisms of grievance redressal, and disclosure of all information related to DMF in the public domain. 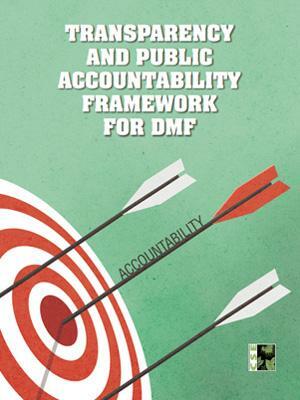 This policy brief discusses how the transparency and accountability mechanisms of DMF may be strengthened to ensure that DMFs function with the principles of good governance.